When your oven starts smelling bad, you had better book our London oven cleaning services to deal with the problem. 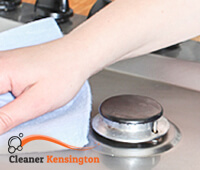 We are hard-working cleaning technicians who have cleaned appliances for many years. We know how to take ovens apart and clean efficiently every single inch of them. We tackle different sizes and types of ovens with ease and we can’t wait to embrace more cleaning projects. Our solutions are more than effective. You should see how we work. Make sure to book a service today. What makes our service so appealing for many Kensington residents is the fact that we do the cleaning right in their homes. It’s much more convenient for them. Not to mention, once we are finished, they can use their appliances straight away. The duration of the process varies depending on the type of the oven and how dirty it is. We may spend from 45 minutes to a couple of hours cleaning. The service is not hourly-based though, so we will keep cleaning no matter how long we have been there and we will leave only after the oven has been cleaned to perfection. The very process consists of a few steps. The first thing we do before we start cleaning is examine the appliance, check the inside and inspect grease and dirt. We think about what cleaning solutions we can use to remove said grime. Then we take the oven apart and soak the racks and other removable parts in cleaning solution. We scrub the outer part and we work our way to the inner part. Then we clean the rest of the oven and put it back together. You will be delighted with the outcome, we are sure of that. 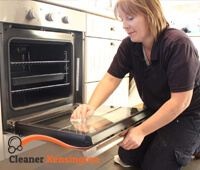 Now, if you are interested in cleaning your oven in a professional way, use our Kensington oven cleaning services and we will get it done in no time. It’s worth calling us. Copyright © 2019 Cleaners Kensington. All Rights Reserved.